*You can mix Swiss and Gruyere for a stronger taste. Some people prefer Cheddar. Dippers – Italian or French Bread cut into about 1 ¼ to 1 ½ inch pieces is a must! We also like thin sausage cut into bite sized pieces. If you’d like you can serve slices of apple on the side. Peel garlic and slice the cloves in half the long way so the most inner surface is showing. Rub a heavy saucepan with two halves of the garlic for flavoring. Rub the fondue pot with the other two garlic halves. Grate the cheese and mix with 1 T. of the flour. Melt the butter in saucepan over medium-low heat. Add rest of flour. Stir well till smooth. Add about ½ cup of milk and stir till smooth. Slowly add the rest of the milk, stirring constantly until the mixture thickens to about the consistency of light cream. Add a handful of cheese and keep stirring. Let the cheese melt and then add another handful and stir until it melts. Repeat the process until all the cheese is melted. Once all the cheese has been added and the mixture is smooth, you can stir in the nutmeg, salt and pepper. Finally, add the lemon juice. Stir well till the mixture is smooth once again. Light the sterno and add cheese mixture to the fondue pot. Eat immediately! Spear bread and dunk in fondue and enjoy. Scrape the bottom of the pot with whatever you’re dipping from time to time to keep it from burning. This article was posted on Sunday, February 12th, 2006 at 8:41 pm	and is filed under Cheese Fondue, Main Course, Non Alcoholic Fondue, Recipes of the World. You can follow any responses to this entry through the RSS 2.0 feed. You can leave a response, or trackback from your own site. WELL my foods group and I are wanting to make fondue for our upcoming free lab but we’re not sure how many people this recipe is made for. There are 4 of us in my group, soo..if you could just get back to me on that it’d be reeealll nice. THANK YOU! If you’re not eating anything else, and there are 4 adults, I’d one and a half or double the recipe. You’ll probably have leftovers, but at least you won’t have to worry about not having enough. Your recipie looks good but i’m throwing a sweet 16 party for myself and I was wondering if you coud substitute vegtable broth instead of the milk. I am afraid of muting the flavor. if you could e-mail me with a reply as soon as possible i would really appritiate it. Thank you for your time, and help. I’ve seen chicken broth used as a substitution for wine in non-alcoholic fondue. I believe chicken broth would have more flavor than vegetable broth. Though I think vegetable broth might be okay. I’ve never made it that way. If you’re using broth, I’d only use one cup instead of 1 1/2 cup like in the milk recipe, since broth is thinner than milk. I like this recipe but I have a fondue set so how do i still make this? I’ve always just made it in the sauce pan and then transferred it to my fondue set to serve. Me too – I make it stove top 1st. Great recipe! I never thought of making it in a seperate pot first, but it works much better that way. I used all Gruyere- it was absolutely delicious! Thanks. I made non-alcoholic fondue tonight following my regular fondue recipe, but substituting chicken broth for wine and leaving out the brandy. My daughter loved it more than the one above (she’s not that into milk). My son liked it just as much as the one above. I could taste the chicken broth. So make sure you don’t mind that taste if you make it that way. The next time I’ll try it with half chicken broth/half vegetable broth. It was wonderful recipe. I passed to all my friends. It’s very informative. Kraft Foods Philippines donated 200 cases of cheese to our organization. We would like to make cheese fondue for our slum dwellers but didn’t know where to start. Thanks to this website, we will try & serve it this Sat. I am writing a cookbook called “The Curious Cook”. I have been searching for a non-alcoholic cheese fondue recipe for ages and this is the only one i’ve managed to find. Would it be okay with you if I include your recipe in my cookbook? I did say where i got the recipe:) Please get back to me on this. I’m going to try this with mozzarella… do you think it will work better with milk, vegetable broth or chicken broth? I found a version online (which I’ve never tried) which mixed fontina cheese with mozzarella and a little parmesan. I think you should make a mix of cheese like this because mozzarella alone might be too stringy. They used milk. The full recipe is at the link above. I’m spending Valentines weekend out of town with my boyfriend and was racking my brain trying to think of a special meal for him, guys are so hard to please! But he LOVES cheese so I thought yay fondue! unfortunately I don’t like wine, so when I found this i jumped for joy, I’ll try this out and we’ll see how the weekend goes ;D thanks! The timing depends on what you dunk in it… if you’re making sausage, you’ll need the time to cook the sausage. The fondue itself takes the time to cut the garlic, shred the cheese, measure the supplies, prepare what you’re dipping into it and then cook it… so it depends on what you prepare in advance and if you have help with these steps. The actual cooking time on the stove is not that long. When I make it this New Year’s Eve it took only about 10 – 15 minutes from start to finish. Do you think it would work with almond milk? 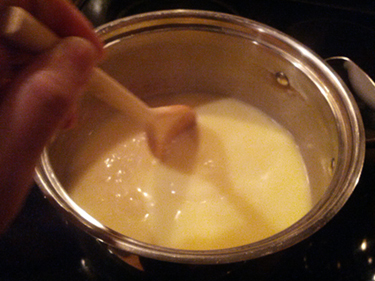 I never made cheese fondue with almond milk… according to other sites, you can cook almond milk on low heat. So I think you could make this substitute. I’d use plain unsweetened almond milk. Another possibility is coconut milk. If you make it like this, please let us know how it turns out. Thanks! Best fondue ever! I needed non-alcoholic because I refuse to have any in the house (out of respect for my father who can’t have it) and this recipe was just perfect. We didn’t have the garlic cloves, but adding a tiny shake of granulated garlic was perfect to add the flavor! We made it with regular swiss, which was wonderful, but I just purchased Kerrygold’s Dubliner Irish Cheese and I have full intentions of using that for fondue in the next few days using your recipe! It would be perfect for St. Patrick’s day, for people who like to do stuff for that! If I make it with the Dubliner, I’ll follow up! Sharing this recipe with everyone! Thanks! Hi, I may sound a bit thick but do the T.’s in the recipe, ie 3 T. All-Purpose Flour, stand for tablespoons? Thank you, Im looking forward to using this recipe. I might use this recipe for a french class. I’m only twelve and I can’t use brandy. I have to make enough for everyone to sample it (about 10 kids in the class). I was wondering how much this recipe makes. I think if you double the recipe you’ll have more than enough fondue for everyone to have some. You don’t need the brandy at all! Enjoy! You can use any milk but the one you choose will determine how thick the fondue turns out. If you use skim milk you probably want to lower the amount because it’s so thin. If your fondue gets too thick you can always add a little more milk at a time. Thanks for the recipe! This was delicious. It’s hard to find a fondue recipe without alcohol. We do not drink and wanted to make on new year’s eve with our children. We used swiss and gouda cheese. Can you make this ahead of time and reheat? Thanks. most likely you can… Whenever I’ve had leftovers, I’ve reheated them in the microwave for a minute or so at a time, stirring the fondue after each minute. It looks very nice! Do you dip something to this founde? Normally we dip small cubes veggies or something when we eat. Do you eat with bread? We eat with bread,too. We dip Italian bread and sausages. * Okay, i am very new to this. What the heck is “T.”???? t spoon? tablespoon? a Tonne??? I made this today and I’m not sure what I did wrong (if anything). It was all nice and smooth until I added the lemon juice at the end and then it got all curdled looking. (Almost like ricotta) We used half swiss and half gruyere. I think it broke. Do you know what could have gone wrong? That’s never happened to me before Kai. I’m not sure what happened. Anyone else? Adding lemon juice to hot milk makes it curdle, I believe. You want to mix it in with cold milk before heating everything. Thanks for the jumping off spot! We had fondue last night and I used veggie broth instead of wine and it worked great. Don’t know why I never thought of using it before this. You could cut the amounts in half, but it might not work well because if you don’t have enough fondue in the pot it will burn quickly. I recommend making the full amount.